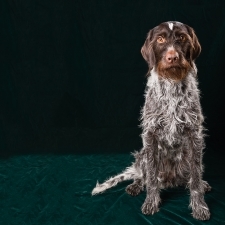 The German Wirehair was developed quite recently in the 19th century in Germany. They were used to point, track, retrieve, and work as a gundog in both the field and water. They are a Griffon type breed of dog developed as the result of careful mixing of the Griffon, Deutscher Stichelhaar (a cross between the Pointer, Foxhound, Pudelpointer and the Polish Water Dog), and the Pudlepointer (which is a cross between the Poodle and a Pointer.) They were developed to be big and robust, while their wiry coat provides protection for them. The German Wirehaired Pointer is active and intelligent. They are very loyal to their family. They are working dogs and like to be active. If bored, their excess energy can turn to destructive entertainment. The more they are taught, the happier they are. This breed needs firm training. Often a clown, the Wirehair provides great entertainment for their family, and they get along with the whole family, including the children. The Wirehair usually weighs between 60 to 70 pounds and stands approximately 22 to 26 inches tall. They are medium‐sized and are well muscled. Their coat is wiry and comes in liver, liver & white either with ticking, roan, or spotted. Their coat usually requires very little care. LIVING CONDITIONS: This breed is not recommended for apartment life as they need plenty of exercise to prevent extreme indoor restlessness, which could lead to destructive tendencies. They do best in a large yard. Their life expectancy is between 12 and 14 years.